I am creating a form for ordering an unlimited amount of a customized product (as shown in the picture). I am trying to create a Discount Code (ANT20) that will take 20% off of the ENTIRE FORM TOTAL (not per item since the amount of items created is endless). I understand the coding for creating the calculations, but as you can see, it does not understand the field name 'total'. In fact, it doesn't understand any field names that I have attempted to use. I'm shooting in the dark because there is no way to find the actual field name of 'subtotal', or 'amount due', etc. This has to be an easy fix. I can't imagine the coders creating a sales form that cannot have a % of the entire order being taken off. Please help! Add additional fees and specify a negative percentage for a fixed discount amount. 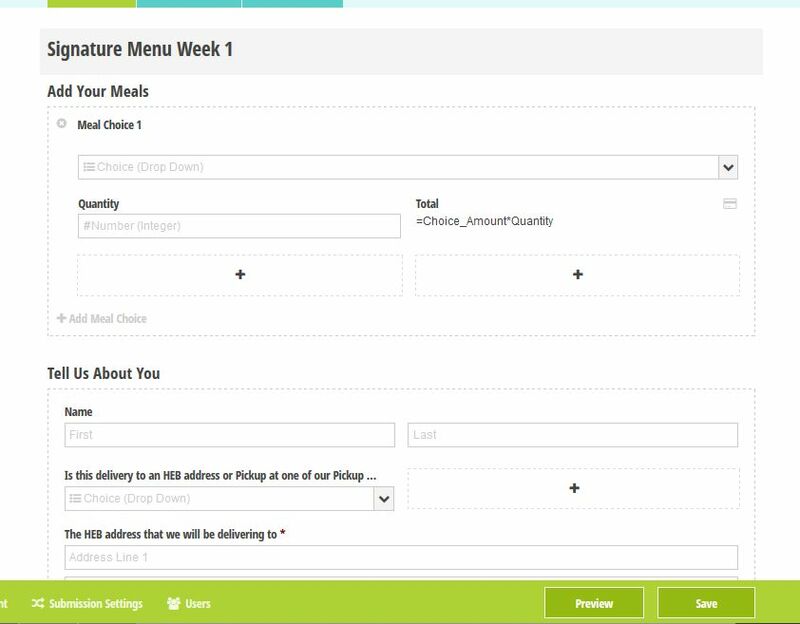 =if CouponCode = "ANT20" then -0.2 * AddYourMeals.Sum(Total) else 0. 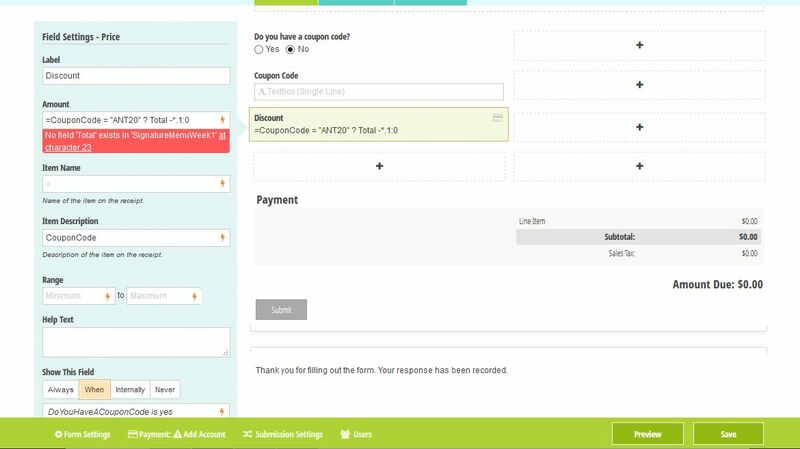 While you can access the order subtotal using this calculation, =Order.OrderAmount, you cannot apply a discount based on this amount because the discounts reduce the order amount. How does the calculated field feature work for Cognito Forms? How do you copy/duplicate a form in Cognito Forms? How do you filter and sort entries in Cognito Forms? How do I apply coupon code calculation in Cognito Forms? Is the Cognito Forms website HIPAA compliant?